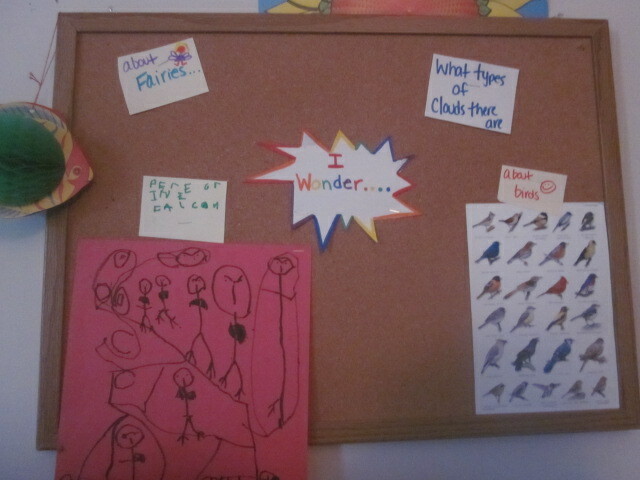 A few months ago I hung an old bulletin board in our playroom with just the words “I Wonder….”. I wanted to see how long before my children noticed the board. A few weeks went by (can you believe it…a few weeks?!?!?) before my son said, “Mommy, what’s that? ?” I explained that it was a place where we could write down questions or ideas that we were interested in exploring and then we could spend time finding the answers or learning as much as we could about that topic. He LOVED this idea and asked me to put up “What types of Clouds There Are” and “Arctic vs. Antarctic”. We decided to jump into the exploration of the poles first and as we were involved with that other interests came up and were put onto the board. We are now deep into a study of birds (mainly the Peregrine Falcon). This board has been a great place to store our other questions and ideas for future exploration. When I taught school, I had my students devote a few pages in their journal to use as “I Wonder…” pages. We even had a box in the classroom for a while to jot down questions or ideas for future study. Of the three, I think I like the board best. The board is a great visual for my young children and I hope that we use it for years to come.